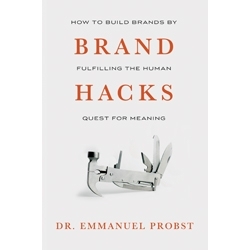 "Brand Hacks: How to Build Brands by Fulfilling the Human Quest for Meaning by Emmanuel Probst"
Every year, brands spend over $560 billion (and counting) to convince us to buy their products. Yet, as consumers we have become insensitive to most advertising. We easily forget brands and may switch to another product on a whim. There are ways for brands to break this cycle. Brands that succeed are the ones that help us find meaning. In this process, the brands become meaningful in and of themselves. Brand Hacks takes you on an exploratory journey, revealing why most advertising campaigns fail and examining the personal, social, and cultural meanings that successful brands bring to consumers’ everyday lives. Most importantly, this book will show you how to use simple brand hacks to create and grow brands that deliver meaning even with a limited budget. Brand Hacks is supported by in-depth research in consumer psychology, interviews with industry-leading marketers, and case studies of meaningful brands, both big and small.